Home » All News » Super-targeting-time! « Lock up your site! Here’s a quick example of how digital marketing directs adverts at your most-likely customers. Google remarketing campaigns use the positive power of cookies to show specific adverts to customers who have already been to your site. So, a visitor to your site leaves (users do leave – often they get distracted before purchase) – perhaps they decide to search Google for a price comparison, becoming at risk of finding your competitor, or perhaps they want to check the weather before booking their event – either way, they leave your site, but your advert, reminding them to return – perhaps with an offer – shows on the next pages* they visit. 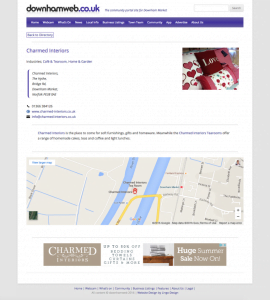 Campaigns, like the Summer Sale advert shown here for Charmed Interiors (designed by Lingo in a variety of different sizes, shown here on the community portal site for Downham Market which uses Google ads) can be set up, managed and run by Lingo Design’s Google Certified Manager, Vicki – and training for webmasters to operate adverts is also available. Interested in finding out what Google ads can do for your business? We’d love to hear from you. *adverts only show on sites with adverts running, literally millions of pages, including Google related products such as Gmail or YouTube.